I mailed you all Christmas Cards! Yes, that right I bought them, filled them out and even printed pictures!! I hope you like them. I didn't take a special picture because I was afraid I'd never send them out, so i just used one I had already taken. 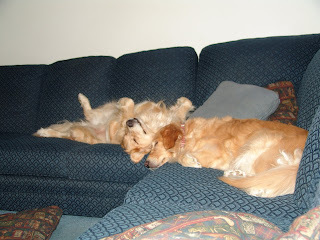 Here are some pictures of my sleepy doggies napping together. just because I thought they were cute. Bye bye now. Oh yay! I am excited to get my card in the mail!! 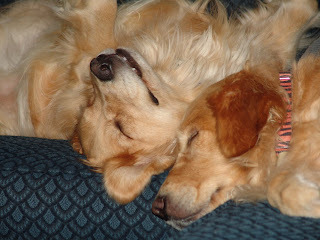 The pics of your dogs are adorable! Woo-hoo! I can barely wait! The mailman is not going to know what hit him tomorrow! Your plug in thing - the music on your blog - is messed up when I come to your blog. It locks up my pc and I have to exit out. I'm not sure if it is just me or if it happens to everyone?? Just letting you know.